The birth of baby Jesus was not an ordinary event. In His birth, divinity became humanity. It was the beginning of the unfolding of the grandest heavenly agenda in bringing salvation to mankind. Jesus was not an ordinary man that lived. He was the God-incarnate. 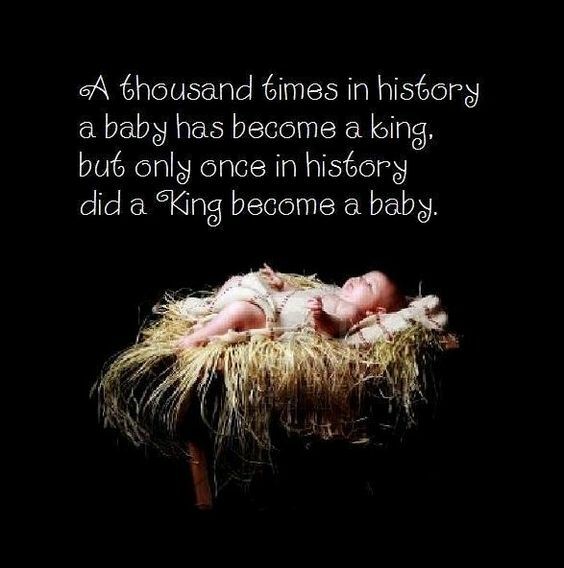 As we celebrate His birth at Christmas, let’s remember some of the things about the baby or the man Jesus that changed the world. 1. Jesus’ miraculous conception by a virgin. Mary the mother of Jesus was a virgin when she got pregnant with baby Jesus. The conception of Jesus did not take the usual union of the male sperm with the female ova. He was supernaturally conceived through the power of the Holy Spirit of God. This is the most unique conception in the history of mankind. And the angel answered and said unto her, The Holy Ghost shall come upon thee, and the power of the Highest shall overshadow thee: therefore also that holy thing which shall be born of thee shall be called the Son of God. Luke 1:35. 2. His conception by a virgin and birth were undeniable fulfillment of Prophecies. The birth of Jesus Christ by a virgin was not a chance occurrence. It was a miraculous event in fulfillment of a divine prophecy given several years before He was born. Therefore the Lord himself will give you a sign: the virgin will be with child and will give birth to a son, and will call him Immanuel. Isaiah 7:14. 3. Jesus got His name several centuries before He was born. “God with us,” that’s the meaning of Emmanuel. God had to take on the form of man, to be with man to be able to save mankind. Hence Jesus had to be born on Earth like a baby. When it was time for the fulfillment of the promise, an angel announced to the ‘highly favoured’ Mary, “And, behold, thou shalt conceive in thy womb, and bring forth a son, and shalt call his name JESUS” Luke 1:31. And she shall bring forth a son, and thou shalt call his name JESUS: for he shall save his people from their sins” Matthew 1:21. Apostle Matthew further educates us saying, “Now all this was done, that it might be fulfilled which was spoken of the Lord by the prophet, saying, Behold, a virgin shall be with child, and shall bring forth a son, and they shall call his name Emmanuel, which being interpreted is, God with us.” Matthew 1:22-23. 4. He wasn’t born to earthly royalty, but angels heralded His birth. Apart from the divine promise of Jesus’ birth, angels announced His birth when it took place. And there were in the same country shepherds abiding in the field, keeping watch over their flock by night. And, lo, the angel of the Lord came upon them, and the glory of the Lord shone round about them: and they were sore afraid. And the angel said unto them, Fear not: for, behold, I bring you good tidings of great joy, which shall be to all people. For unto you is born this day in the city of David a Saviour, which is Christ the Lord. Luke 2:9-11. 5. The birth of Jesus is the proof of God’s love for the world. 6. Jesus was born to die. Jesus was born to be the Saviour of the world. To be Saviour He had to die for the sins of the world. At Christmas, we celebrate His birth and at Easter, His death and resurrection. Speaking about His then impending death, Jesus said, “The Son of Man will go just as it is written about him….” Matthew 26:24a. Babies are born to fulfill their purposes in their lifetime. But it was in Jesus’ death and resurrection that He fulfilled the ultimate purpose of His birth – the redemption of mankind. “In order to save the world, Jesus had to die for it. He came and lived the perfect life and then died the death we should have died. The true meaning of Christmas is that Jesus was born to die. Because He was crucified and then rose from the dead, forgiveness of sin and assurance of heaven is now offered to all who believe” (John 1:12) – Richard Dehaan. 7. Jesus is the only man in history with the complete tripartite cycle of birth, death and resurrection. Men are born, they live, they die and they remain dead. But Jesus was born, He lived, He died and resurrected. He is alive forevermore. I [am] he that liveth, and was dead; and, behold, I am alive for evermore, Amen; and have the keys of hell and of death. Rev. 1:18. 8. He is the only one giving eternal life to anyone who believes in Him. The baby Jesus that was born by a virgin, Mary, lived and died but resurrected. He is alive forevermore giving eternal life to all that comes to Him. And I give unto them eternal life; and they shall never perish, neither shall any [man] pluck them out of my hand. John 10:28. Jesus was more than a baby. He is the God-incarnate. As the Saviour of the world, in Him lies the eternal hope of mankind. Remember that as you celebrate this Christmas. If you like this article, feel free to share with your friends on Facebook, Twitter. WhatsApp, Google+, etc. Great truth, great teaching, and a great post on our great Savior. Very well done, Victor. Thank you for reading and commenting. It’s my privilege to share the truth about our incomparable Lord and Saviour. To God be the glory. I more than liked your Message Victor I Loved it, when people doubt Jesus Divinity it is because they are Spiritually in darkness, as you shared it is very clear in God’s inspired Scripture, Thank you and yes I will share it with my followers too. I am glad you like it Anne. And thank you for lending your voice to the message by sharing it with your followers. I really appreciate the kind gesture. Yes I did appreciate your message very much Victor, although I have found there is not much response with Reblogs we never know who may read them in the future and I also value your thoughts and Reblogging is a good why to save them. Reblogged this on Freedomborn … Aussie Christian Focus. Thanks Anne for the reblog. I remember learning about the virgin birth of Jesus. One of the applications was that the Holy Spirit creates “new life” in us. As Christians, we are all miracles of God with His new life inside of us! You are absolutely right Debbie. Thanks for the additional insight. I beg to differ, because we believe it happened. I concede you are entitled to your own opinion. But it doesn’t change anything for me. I would rather believe that it happened as the Bible said it did. I would wish that you will believe it too.